I’ll be the first to admit that I don’t often think about David Arquette. Sure, he was Deputy Dewey in the Scream movies, and that was fun. I remember something about him marrying one of the Friends. Maybe David Schwimmer? 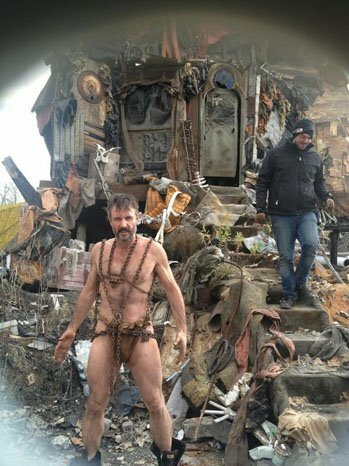 At any rate, one way I absolutely never thought of David Arquette? Dressed like this. For the love of God, man, at least wear a hat. You may not know who Diora Baird now, but you might have if her scene as a green-skinned Orion slave girl hadn’t been cut out of JJ Abrams’ Star Trek. She’s not the one who Kirk bangs in Uhura’s quarters, she’s a different, spunky chick who Kirk encounters in the hallway and confuses for his most recent conquest because, well I guess Kirk’s a racist and all green skinned people look alike to him. The past few days have been so flooded with cool Star Trek tidbits that it’s probably starting to seem like this is a Star Trek fan site. Well it isn’t, it’s just a sci-fi site run by a Star Trek fanboy, who can’t help but be excited over stuff like this. MTV has scored new images from Star Trek, among them your much anticipated first look at an actual green-skinned, generously proportioned, Orion slave girl. Admit it, you had a dream or two about green women after you first saw Vina shaking it in The Cage. Who hasn’t.